While my 7 year old wasn’t very interested in the cutesy crab and jellyfish, he was very interested in making a sea urchin. I highly recommend you use washable markers for this project because it gets all over the kids’ hands. Directions: Start by using your marker to color the toothpicks. 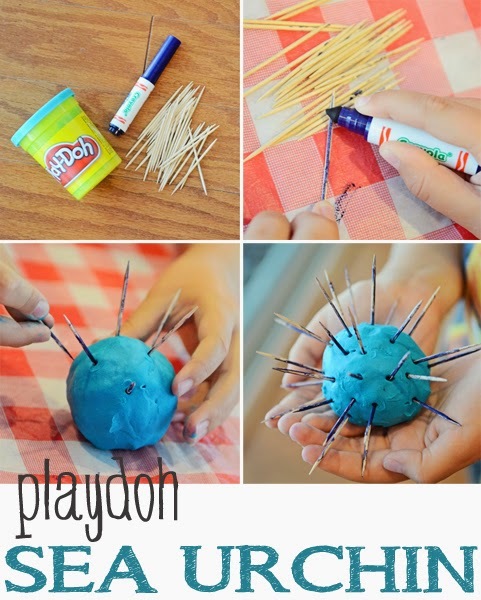 Roll your playdoh in a big ball and add your sea urchin spines. We allowed ours to dry for a few days until it was hard. This would also be fun to do with clay.